Don't you love the smell of a baby??? That smell is even better when you know it is from natural, safe, and non-toxic baby products! My daughter smells SO GOOD because of the Live Clean Baby products I have been using on her lately! I am so glad they have recently launched their products in the U.S. because now YOU enjoy them too! 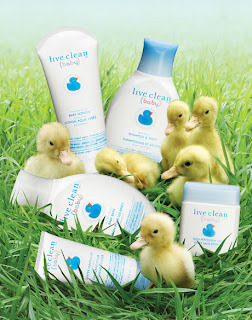 Live Clean, the Canadian brand of eco-friendly personal care products, arrives in the US with the launch of Live Clean Baby. This simple, environmentally aware collection of products is specially formulated with both mother’s concerns and baby’s sensitivities in mind. Using only natural, non-irritating, supremely gentle plant based ingredients, Live Clean Baby performs efficiently and gently to keep baby looking, feeling and smelling their very best. Live Clean Baby is committed to providing products that contribute to a greener planet and, at the same time, perform at the highest level. Moisturizing Bar Soap: enriched with Shea butter to gently moisturize baby’s skin. What I love the most about Live Clean Baby is that all the products are both environmentally responsible and highly efficacious. Formulated without many of the commonly used chemicals that are damaging to the environment and, some believe, our well-being, Live Clean is free of Sodium Lauryl Sulfate (SLS), a common chemical surfactant used in most shampoos, as well as Diethanolamine (DEA), a common ingredient used for rich lather and viscosity building. Live Clean is also free of parabens (preservatives used to extend the shelf life of personal care products) and other harsh preservatives, as well as phthalates (chemicals commonly used to make fragrances last longer). Live Clean Baby is vegan with no animal ingredients used in the formulations. The collection is also cruelty free; none of the products or their ingredients has been tested on animals. In its sensitivity to the environment, Live Clean is also free of phosphates, known contributors to water pollution. They also care enough to make the packaging as earth-friendly as possible. The Live Clean containers are recyclable; they are made from “virgin” materials, making them far easier to recycle than many plastics. Shipping cartons are made from recycled materials and even the inks used on shipping cartons are safe for the environment. Local vendors are used to the maximum which cuts down on gas consumption and emissions thus reducing their overall carbon footprint. It is seriously amazing how much they care about their products and, thus, our children! From the packaging to the safe ingredients to the amazing fresh baby smell, they have thought of it all and I seriously appreciate that!! My favorite products were the Shampoo and Body Wash and Moisturizing Lotion. The Shampoo smelled so clean and suds up to make my daughter clean and smelling good! The Lotion was super smooth and absorbed in really well and my daughter smelled SO GOOD and her skin was so SOFT afterwards! I also love that they offer a Non-Petroleum Jelly! I have never seen that before so I love that this jelly works great when baby needs an effective moisture barrier that is petroleum free! If you are looking for some amazing baby products that not only smell amazing but work well and are super safe for your children's sensitive skin, then look no further than Live Clean Baby, a company that cares A LOT about their products and your children too! Buy It: You can purchase Live Clean Baby for $7.99 and it is available exclusively at Walgreens, as well as online at Walgreens.com. 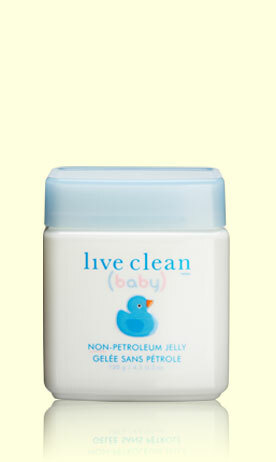 Win It: Live Clean Baby is generously offering (1) Entire collection of Live Clean Baby to a lucky winner!